This year saw 2017 the commencement of a new school, in the Wollongong Diocese, at Edmondson Park, NSW. It is St Francis Catholic College, a Diocesan Catholic college in the Edmund Rice Tradition. The College is located in the Mary Mother of the Church Parish, Macquarie Fields. St Francis Catholic College will be a Preschool to Year 12 College with an eventual enrolment of more than 1600 students. Catholic Care will provide a before and after school care service plus the running of the preschool. The College will commence in 2017 with a Preschool, 3 Kindergarten Classes, one each of Year 1 to Year 6 and three Year 7 Classes – with an enrolment of approximately 250 students. Sr Margaret’s ministry is pastoral in Family/School Liaison. 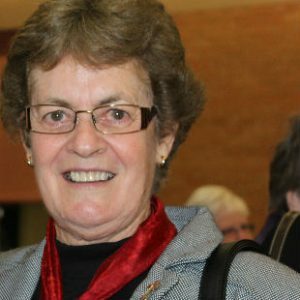 Within this role, Sr Margaret visits families connected with the school and support students attending the College, particularly those who are experiencing difficulties in any way. She will also support and work with staff members. Unfortunately a number of issues outside the College’s control led to delays in obtaining final Council approvals for the buildings and the delivery of essential road networks and services for the initial stage of the school on the proposed site, therefore a temporary school will be established for the commencement of the 2017 school year at Oran Park adjacent to the existing St Benedict’s/St Justin’s School site. The temporary site will be largely self-contained and include all of the facilities planned for the initial stage at Edmondson Park – General Learning Areas, specialist facilities for Technical and Applied Studies, Staff Study and a Hall. It will also provide a grassed playing area and covered playground. Liberating Education: We open hearts and minds, through quality teaching and learning experiences, so that through critical reflection and engagement each person is hope-filled and free to build a better world for all. Gospel Spirituality: We invite all people into the story of Jesus and strive to make his message of compassion, justice and peace a living reality within our community. Inclusive Community: Our community is accepting and welcoming, fostering right relationships and committed to the common good. Justice & Solidarity: We are committed to justice and peace for all, grounded in a spirituality of action and reflection that calls us to stand in solidarity with those who are marginalised and the Earth itself. In the words of Bishop Peter Ingham, “we pray that the future students of this new Catholic school will be similarly motivated and encouraged to live lives of joyful hope and generosity, just as St Francis did.” May God bless this new venture and all who are part of it.